A #Vikings turnover gives DET the ball at the Vikings 42. Ameer Abdullah has five carries for 35 yards so far. Who was given that fumble? Technically I think it's on the QB. That's the same play as Favre-Peterson vs. Saints in NFC title game. Ameer Abdullah with 35 yards on five carries. #Vikings allowed 38 rushing yards to Detroit in Week 2. Everson Griffen, who was not seriously injured, just destroyed Matthew Stafford. 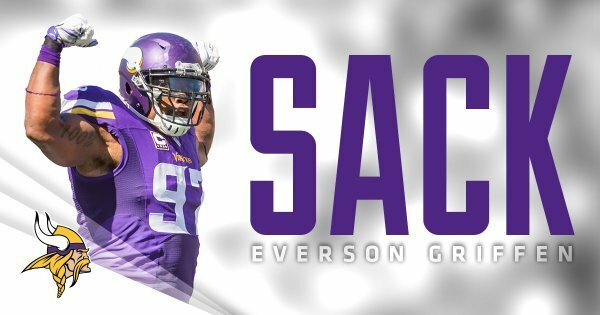 Maybe block that guy.
.@EversonGriffen records his team-leading 4th sack of the season. Matt Prater hits a 52-yard FG to give the Lions a 17-6 lead with 5:03 left in the second quarter. A DET FG gives them a 17-6 lead over the #Vikings . It's those **** purple pants! 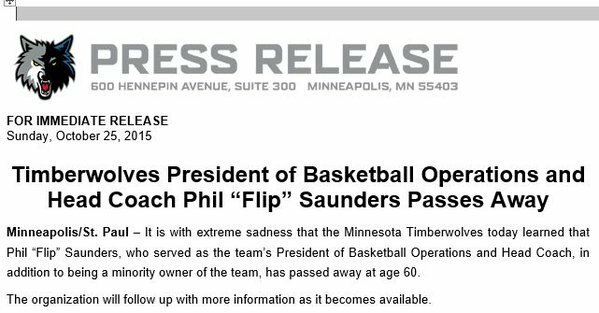 The Flip Saunders news is awful. Just awful. Thinking of his family and the @Timberwolves organization today. Wow. Suddenly this football game doesn't seem very important. Just makes you so sad. Zach Line, pride of Oxford, Mich., is wide open and gains 49 yards on a reception. The Vikings are in the red zone. All Zach Line does is score touchdowns and stretch the field. FB Zach Line with his 3rd career catch and takes it 49 yards. @JetMckinnon1 pushes the #Vikings inside the 5! Man, the Vikings coaches really hate Adrian Peterson. It's hard to care about football with this Flip news. Zach Line's 49-yard reception is the 3rd longest among FB's in 2015. Lions with a TO at 1:54 mark. They might try to score again at end of half. Vikings get ball first in second half. Bridgewater to Kyle Rudolph for a 1-yard TD on play action. Vikings cut into the Lions lead. And Walsh missed the PAT wide right. Lions lead 17-12 with 1:49 left in the first half. 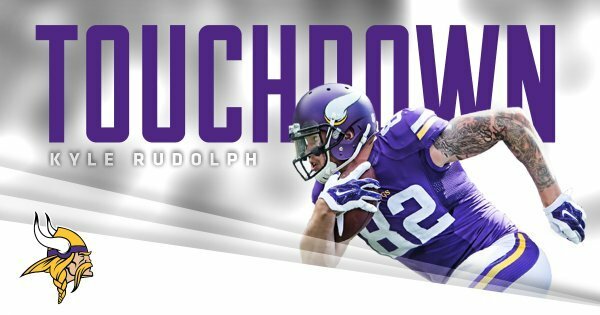 Good snag by Kyle Rudolph for his third touchdown of season. #Vikings haven't won shoving match all game, so go to pass at goal line. @teddyb_h2o finds @KyleRudolph82 in the end zone!
. @KyleRudolph82 's 2nd straight game with a TD. Now has 20 career TD receptions. 17-12 #Lions lead with 1:49 to play in the 1st half. There was a gust of wind to push that kick wide to the right? Ameer Abdullah is ruled down, but he might have fumbled again. Abdullah was down. No review. Lions ball.